Sometimes when Bugaboo is sleeping, I wonder what it would be like if he woke up able to converse and use a spoon effectively and quickly climb the playground equipment. Mostly I stay stuck on the wondering what it would be like to have a typical three and a half year old conversation with him. What funny things would he say? Would he tell me all about his day at preschool or would he just answer,"Good," and "Nothing," like Bubby used to do on his ride home? Would I be learning about the things that make him happy and sad and angry and scared? Would he ask me lots of questions, too? I picture it like a Sleeping Beauty coming awake or Dorothy returning from her trip to Oz - the discovery of his ability to really communicate. It would be an amazing and beautiful thing. A group the boys and I attend weekly is pushing Bug back to an even younger class than what he was originally assigned. I got the call about it this weekend, and even though I knew it was coming, it still broke my heart. He understands what is going on in the stories and activities; he just doesn't react or engage the same way the other preschoolers do. He loves going to class. I watch him at his Cubbies group at church each week. He knows all of the kids names and who is missing. He memorizes his verse, and at home I overhear him singing the songs. But game time is hard for so many reasons. I helped him through his first "friend" birthday party he was invited to. I was thrilled he was included, but intimidated by it, too. He did well with assistance, and he had a good time even though his time looked different than the other preschoolers' time. I love how he is included at church and with our friends, but it is emotionally difficult to see all the things he still can't do and may never do. Tonight after watching big brother play in his soccer game, Bugaboo said on the ride home, "Thank you for taking me to soccer. I had a good time at soccer." (Bug's newest phrases are "Thank you for _____" or "I had a good time at ______" if we do something he likes.) I love that him telling us that meant that he liked (or at least didn't mind) going to sit and watch Bubby's soccer game. Yet it made me want to cry my eyes out. Will he ever get to participate in soccer? Will he ever go to a friend party without his mom or big brother helping him or without him being content to just wander away from the other kids? The cerebral palsy motor issues plus his other struggles seem to be a double whammy against him for things like that. We celebrate him using a spoon with his cereal. We celebrate him balancing for a moment on the big boy swing. But there's so much out there we haven't even begun to really tackle yet, and quite frankly it is overwhelming. We have good days and we have hard days and everything in between. Somehow we keeping putting one foot in front of the other, sometimes with tears but usually with a smile on our faces. He seems happy - other than when he's having a meltdown about something, of course. But on our good days he is easy going (especially if we stick to the routine), snuggly, and happy with the life he is living. How much does a mom push? How much does a mom just take it as it comes? How much does a mom let go of some things? There's not clear cut answers on these types of questions. Our mystery child surprises us again. This weekend our family was given free tickets to a local theme park thanks to the Appreciation Day for The Hubs' work. We were not sure how it would go for Bugaboo, but since we were getting in for free, we were willing to take the chance that our day may look very different from other families. I cannot even begin to say how happy I am that Bug had not just a good day - he had a fantastic day! He rode in the rented park stroller without complaint. He waited in line better than any other three year old. He LOVED every single ride, even the kiddie roller coaster and what I will term "the pseudo roller that the whole family can ride." He laughed on the dips. He loved the "fake Dumbo" ride. He devoured his portion of the funnel cake, which isn't quite as good as a churro, but was pretty excellent. All day, "I ride my horse." "I drive my train." "I ride my elephant." Then there was the train - we rode it twice. Each time he was so excited - there was the flapping and happy stomping and sounds he typically saves for his love of Veggie Tales. He had a bit of a difficult time mid-ride each time when there is a "show" to watch off the side of the train. He didn't understand that, and was ready to keep moving, but even that did not cause a meltdown which would have left us stranded in the woods next to the tracks. I don't know if I have ever seen him so filled with joy. On our second train ride near the end of the day, I looked over at The Hubs during one of Bugaboo's very obvious happy moments and almost cried happy tears. Bug has been working (and doing well with) thank you phrases lately. As we were exiting the gates at dark, Bug says, "Thank you for taking us outside, Daddy," which was his way of saying he was glad we came. Can't see much of Bugaboo here. In other news, my five year old may need therapy for me putting him on a roller coaster with me first thing in the day. I thought it was going to be like Big Thunder at Disneyland. My poor child was white as a ghost saying, "I'm scared, Mommy!" We made it through. He even managed to go on the kiddie coaster after some tears in line and say at the end, "That wasn't so bad!" He is still talking today about the roller coaster he didn't like yesterday.I guess being tall enough to ride something doesn't mean it won't be scary for a small person. Lesson learned. He did enjoy most of the other rides he went on, especially the ride that let him shoot at targets (which he ended up not shooting). BEFORE going on his first ride. We had no idea what he was in for! I rode my first thrill rides in at least a decade. I may have prayed on them. I know when one coaster shot me up the hill (yes, you read that right - it shot me up a hill just to start the ride) I shouted out, "Oh Dear Lord!" I become a prayer warrior on roller coasters, even though I love them so. I saw the place to get salt water taffy, just like my Papa used to get. I almost went in to get some, but I just couldn't. For some reason it made me sad and miss him a lot. He would have had fun watching the boys at this park he took me too over two decades ago! It has been a long journey getting The Hubs to his RN this last spring. He finishes his bachelor's in December. He's working two jobs and taking those classes. It was such a good time to spend together on his day off. I feel almost ready to tackle the upcoming weeks. All is forgiven on the safe "fake Dumbo" ride. Selfie taken on the teacups - makes me smile. *Wish I would have brought my good camera/been able to take pictures on more of the rides. These few pictures I took were with my phone or old point and shoot. Five Minute Friday is a chance to write for only five minutes on a given prompt without editing and then share and connect with other writers. This week's prompt is whisper. More details can be found here. The stranger in the seat in front of us leaned into his toddler's ear, "Look at that baby." My three and a half year old had been making pre-meltdown, kind-of-happy-but-could-turn-at-any-moment noises. I was juggling him and my content and helpful five year old alone in a new place. "He is three and a half, not a baby! Having special needs does not make someone a baby!" is what I wanted to stand up and yell. But instead I ignored and whispered, "shhh shhh shhh," in the ears of my youngest, trying to distract him with bouncing and a couple of other things. It didn't work. Less than ten minutes later my child got very loud. Slightly upset but mostly just loud because he doesn't understand how to whisper or why we whisper or when we whisper. He was calm by the time we got to the car, happy to be out of that big room, happy to be going home. My five year old handled our quick exit with grace. But I sat in my car and cried for a few minutes before driving home. "It's not fair," says the voice in my head, the voice that has been telling me all my life of all the unfairness of the world. I wrestle with that statement on fairness. I know the right answers, most days I even believe the right answers, but if I think too much about the future I get overwhelmed and frustrated that I don't seem to have the keys to unlock my child's mysterious mind., to help ease the frustration he seems to be feeling at times. My Christmas present the first year of marriage sits in our living room. Almost a decade ago, The Hubs found a used piano at a place he was volunteering for class and purchased it for me a few weeks before Christmas. Various children (my own included) have nicked the keys with their toys (not allowed on the piano! ), it needs to be tuned, the left pedal is stuck for some reason, but it is still one of my favorite gifts ever. 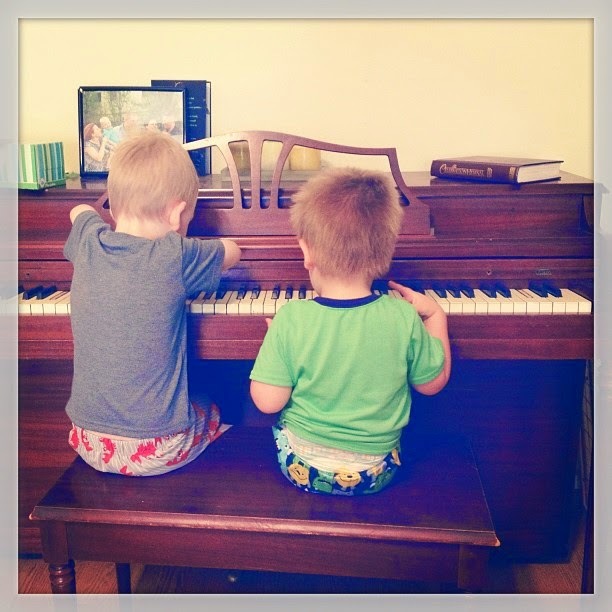 Bubby started piano lessons last week. Although he is tall for his age, his feet still don't touch the floor from the bench. He sits for a few minutes each day practicing his two pages. The sets of black keys - first the pair, then the trio - up with his left hand and down with his right. 3-2, 3-2, 3-2. 4-3-2, 4-3-2... I sing and he says the numbers as he plays. He inherited my long fingers, and even though this non-song is all he can play right now, it is a beautiful sound. I remember my first two songs I learned to play, also on the black keys. It was in Susie Harper's living room. "In his right hand way up high, red balloon flies in the sky," as my right hand played the three black keys above middle C. I don't know why I remember this, but I do. And she had a poodle named Buffy who would bark when we would come in the door. I remember many things about piano lessons. I loved piano. I didn't always like practicing, but I loved piano. One of my biggest regrets in life is quitting in middle school. I think that was the only thing I could control back then, when it felt like my life was falling apart. Quitting piano and quitting (postponing) algebra until high school. I don't regret algebra, but hardly a week goes by when I don't regret my piano decision. I wish I had my piano teacher's email address. I would tell her I've never stopped playing. I'm not any good and I didn't reach my potential, but I still love to play. I would tell her I play when the kids allow me alone time with the keys (which isn't often). And I would tell her one of my new happiest moments has been this week, watching my own five year old learning to curve his fingers and play up and down the piano for the first time.